PERFUME EMPORIUM may change these Terms and Conditions and the Privacy Statement at anytime, without notice. Such changes and their effective date will be posted on the PERFUME EMPORIUM website at http://www.perfumeemporium.com and/or PERFUME EMPORIUM will attempt to notify You of these changes through other means. You agree to review changes to these Terms and Conditions and the Privacy Statement and if any change is not acceptable to you, you agree to terminate use of Perfume Emporium Services. Your continued use of PERFUME EMPORIUM Services after the effective date of any such change constitutes your acceptance of all of the changes. You are responsible for all use of Your account and for the security of Your login identification so you should not transfer or permit any other person to use Your account for PERFUME EMPORIUM Services. Positive Beauty Buck Balances may only be used at PERFUME EMPORIUM's site as a form of payment. A positive balance on PerfumeEmporium.com does not have any cash value. To receive the referral bonus for referring a new member, the referral must provide a valid name and email address and PERFUME EMPORIUM reserves the right to determine if a referral is invalid or fraudulent. If the referral is deemed by PERFUME EMPORIUM to be invalid or fraudulent, your account will be cancelled, all referral bonuses will be deducted from your account and all beauty bucks orders will be voided. Posting on message boards or spamming others is not allowed. Generating referrals for the sole purpose of getting the referral bonus is also not allowed and membership may be cancelled at the discretion of PERFUME EMPORIUM if PERFUME EMPORIUM feels the member has no other purpose of joining than to get the referral bonuses or if none of their referrals make purchases in a reasonable amount of time. A reasonable amount of time will be determined at the sole discretion of PERFUME EMPORIUM. Although PERFUME EMPORIUM fully intends to keep http://www.perfumeemporium.com up and running, it may be possible at sometime to terminate the program. Should PERFUME EMPORIUM have to terminate the program, all members would still have 30 days to complete transactions with their established balances. 30 days after the termination of the Perfume Emporium Beauty Bucks Program, all positive balances earned from the site will be lost. 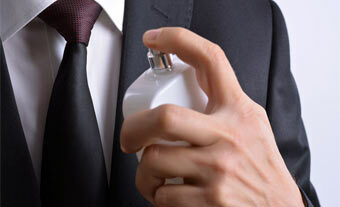 You must be eighteen (18) years or older to use PERFUME EMPORIUM's services. YOU AGREE TO DEFEND, INDEMNIFY AND HOLD PERFUME EMPORIUM AND ITS AFFILIATES HARMLESS FROM AND AGAINST ANY AND ALL CLAIMS, LOSSES, DAMAGES, LIABILITIES AND COSTS (INCLUDING, WITHOUT LIMITATION, REASONABLE ATTORNEYS' FEES AND COURT COSTS) (COLLECTIVELY, "CLAIMS") ARISING OUT OF OR RELATING TO YOUR BREACH OF ANY OF THESE TERMS AND CONDITIONS OR USE (BY YOU OR ANY THIRD PARTY) OF PERFUME EMPORIUM SERVICES, EXCEPT TO THE EXTENT SUCH CLAIMS DIRECTLY RESULT FROM PERFUME EMPORIUM'S OWN NEGLIGENCE. THE FOREGOING INDEMNIFICATION OBLIGATION SHALL SURVIVE ANY TERMINATION OF THESE TERMS AND CONDITIONS OR OF PERFUME EMPORIUM SERVICES PROVIDED TO YOU. YOU ACKNOWLEDGE THAT PERFUME EMPORIUM SERVICES ARE PROVIDED "AS IS, AS AVAILABLE" WITHOUT ANY WARRANTY OF ANY KIND INCLUDING, WITHOUT LIMITATION, ANY WARRANTY WITH RESPECT TO THE QUALITY, PERFORMANCE OR FUNCTIONALITY OF PERFUME EMPORIUM SERVICES OR WITH RESPECT TO THE QUALITY OR ACCURACY OF ANY INFORMATION OBTAINED FROM OR AVAILABLE THROUGH USE OF PERFUME EMPORIUM SERVICES OR THAT PERFUME EMPORIUM SERVICES WILL BE UNINTERRUPTED OR ERROR-FREE. PERFUME EMPORIUM DISCLAIMS ALL WARRANTIES, EXPRESS OR IMPLIED, INCLUDING, WITHOUT LIMITATION, WARRANTIES OF TITLE, MERCHANTABILITY, FITNESS FOR A PARTICULAR PURPOSE AND NON-INFRINGEMENT. IN NO EVENT SHALL PERFUME EMPORIUM BE LIABLE UNDER ANY SECTION OF THESE TERMS AND CONDITIONS OR UNDER CONTRACT, NEGLIGENCE, STRICT LIABILITY OR ANY OTHER LEGAL OR EQUITABLE THEORY FOR ANY INDIRECT, INCIDENTAL, EXEMPLARY OR CONSEQUENTIAL DAMAGES (INCLUDING, WITHOUT LIMITATION, LOSS OF USE, LOST PROFITS, LOSS OF DATA OR INFORMATION OF ANY KIND OR LOSS OF BUSINESS GOODWILL OR OPPOR-TUNITY) WHETHER OR NOT PERFUME EMPORIUM HAS BEEN ADVISED OF THE POSSIBILITY OF SUCH LOSS OR DAMAGES. PERFUME EMPORIUM SHALL NOT BE LIABLE FOR THE COST OF PROCUREMENT OF SUBSTITUTE GOODS, SERVICES OR TECHNOLOGY AND IN NO EVENT SHALL PERFUME EMPORIUM'S LIABILITY TO YOU EXCEED ONE HUNDRED DOLLARS ($100.00). NO ACTION, REGARDLESS OF FORM, ARISING OUT OF THESE TERMS AND CONDITIONS MAY BE BROUGHT BY YOU OR PERFUME EMPORIUM MORE THAN ONE (1) YEAR AFTER THE CAUSE OF ACTION HAS ACCRUED. Entire Agreement. These Terms and Conditions, the License Agreement and the Guidelines (the terms of which are hereby incorporated by reference) together constitute the sole agreement between Perfume Emporium and You respecting the subject matter hereof and fully supersede any and all other agreements, either oral or in writing. You acknowledge and agree that You have read these Terms and Conditions, the License Agreement and the Guidelines and understand their terms. Legal Actions. This Agreement and its validity, construction and performance shall be governed in all respects by the laws of the State of California. Exclusive jurisdiction and venue for all matters related to this Agreement shall be in the state of California, and the parties hereby agree and consent to such jurisdiction and venue. Any claim or controversy that arises out of or relates to this Agreement, or the breach of it, shall be settled by arbitration in accordance with the rules of the American Arbitration Association. Judgement upon the award rendered may be entered in any court with jurisdiction. Severability. If any provision of these Terms and Conditions is held to be unenforceable for any reason, such provision shall be reformed only to the extent necessary to effect the original intentions of the parties, and the remainder of these Terms and Conditions shall remain in full force and effect. No Waiver. Any failure of PERFUME EMPORIUM to enforce any provision of these Terms and Conditions shall not constitute a waiver of any rights under such provision or any other provision of these Terms and Conditions.